We've reached the final matchup of the second round already, and boy this set of polls have been very closely contested. Some of the results have been a surprise, some have been very obvious, and Chandhok's success wasn't a runaway victory! 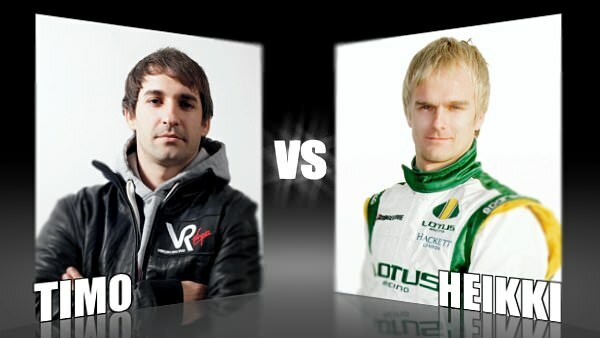 Today, though, we have a battle amongst the new teams - Timo Glock against Heikki Kovalainen. Glock saw off competition from Nico Rosberg in the first round of this year's Character Cup, and it was a really close battle between them - although it was the lowest voted heat of the cup so far. In the race today, Glock started as best of the new teams, but fell behind the two Lotus cars towards the end to finish 16th. Heikki had a first round showdown with Sebastian Vettel, and came through very easily. If he was facing Vettel again, particularly today, it would be a super easy path through to the next round with such a grumpy Red Bull opponent. As it is, Heikki has to stand against his fellow new team rival Glock, as Virgin Racing take on Lotus Racing to make it through to the semi-final.